Employee benefits are employer-hosted perks like health insurance, commuter benefits, 401k savings plans, and life insurance. Offering a benefits package can cost from $0 to hundreds of dollars per employee per month. An employee benefits package helps you attract and retain quality workers; you’ll need two things to start—a benefits provider and a budget. For small businesses, the best option is not to negotiate and cobble together the myriad of benefits programs into one impossible-to-manage package. Instead, we recommend you find a benefits vendor that manages benefits offerings, administration, payments, and employee enrollment for you. We recommend you check out a company that can outsource your benefits for you, like ADP TotalSource, an all-inclusive, professional employer organization (PEO). You may know of ADP as a payroll provider, but ADP provides a PEO that offers a full benefits package, including 401(k), health insurance, HSA, commuter benefits, and more. Find out if it’s right for you today. Here are the six steps to set up an employee benefits package. Deciding what benefits to offer requires that you consider which benefits your employees might find valuable. An employee benefits package can be as limited or as grand as you like. A recent survey from PEO Justworks found the benefits that employees want most are health benefits; but low cost perks and paid time off also ranked highly. Many, like the first five benefits shown below, are available to an employee as pre-tax options, lowering an employee’s overall taxable income. Their benefit deductions are subtracted before tax withholdings are calculated on the employee’s paycheck (this can also lower your payroll tax liability). On the fence about what benefits to offer? Read our article on Company Benefits Stats to see what other businesses are doing, and also to determine which benefits might bring you the most value based on your employee demographics, company size, and industry. It’s important for every business, small or large, to provide appropriate benefits to their employees because it encourages them to stay with you, feel good about where they work, and feel good about your concern for them. It also shows their value to you. Based on the type of benefits you provide, you’ll need to set up a budget. The least expensive benefits are one-time items like a company T-shirt or employee pizza party. The most costly (and valuable to employees) are health-related benefits like medical insurance and health savings plans. Recently released data from the Bureau of Labor Statistics show the various amounts that employers pay for different kinds of employee benefits. The percentage that employers spend is well upwards of 30% of each employee’s total compensation. For example, for an employee making $35 per hour, the average employer pays an additional $13 per hour in benefits. For a 401(k) solution that your employees will love and won’t cost you a fortune, you may want to check out Human Interest. Their dedicated account managers will provide compliance support and help your employees choose great low-fee options for their investments. For a company with 20 employees, it would cost $200 per month. Get more information here. Using a PEO like ADP TotalSource, or a payroll software like Gusto that sells insurance, is a great way to increase the kinds of benefits you can offer to your employees. Both provide health insurance and other options, like a 401(k) retirement plan for your small business employees. Let’s next take a look at these two along with other kinds of benefits providers. Companies that administer employee benefits are known as benefit providers. They vary widely in terms of cost, types of benefits, and the size of businesses that they work with. On one end is something basic like a company that provides an employee assistance program (EAP) for a few dollars per employee per month. At the other end is outsourcing your entire employee benefits package by working with professional employer organization (PEO). That can cost thousands of dollars a year. *Alternative providers include companies like Human Interest, which offer 401(k) plans, or Zane Benefits, which only do HRAs. Other businesses, such as your bank or credit union, may be able to offer benefits in addition to payroll processing. Some PEOs like TriNet can even offer employees discounts on tickets and purchases. However, if you’re looking for an all-inclusive option, PEOs like ADP TotalSource and Justworks, and HR/payroll providers like Gusto and Zenefits, may provide you with great rates and more choices than trying to negotiate with big insurance firms on your own. Most small business owners will want to use one of providers we describe below to ensure labor-law compliance and eliminate time-consuming administrative hassles. A PEO is an external organization that manages HR, payroll, and employee benefits for you. PEOs pool together small businesses to offer big-company benefits—like medical and life insurance—at a lower cost. They also ensure your business stays in compliance with tax, state, and federal laws, like workers’ compensation and overtime. PEOs vary greatly in price from under $100 per employee per month for Justworks to thousands of dollars a year. However, in the long run, they may save you money on health insurance and workers’ compensation rates. You can read full details on the PEO providers we recommend, including Justworks, TriNet, and ADP TotalSource. In full disclosure, Fit Small Business uses a PEO for our employees’ HR, benefits, and payroll. With some remote staff and a home office in NYC, it made financial sense for us to work with a co-employer to offer great benefits to our distributed team. For a free broker consultation on which PEO is best for your specific business, industry, and location, we recommend you contact The Huldisch Group. ADP TotalSource is a full-service PEO that offers HR services, payroll, tax processing, benefits administration, attendance tracking, workers’ comp, and more, all in one package. Click here for a free quote. Most cloud-based HR software can manage employee benefits. Some, like Zenefits, provide health insurance as well. HR software makes sense for a small business once you get to 10 employees or more. That’s because managing HR processes like employee onboarding and personnel files becomes time-consuming as you add additional staff. Like a PEO, HR software can provide health, dental, vision, life, and disability insurance, as well as a 401(k) and retirement planning. It can also provide alternative health benefit options like FSAs, cafeteria plans, and commuter benefits. And typically, HR software can track PTO and holidays for you, ensure fringe benefits are managed correctly, and pass data to your payroll system. 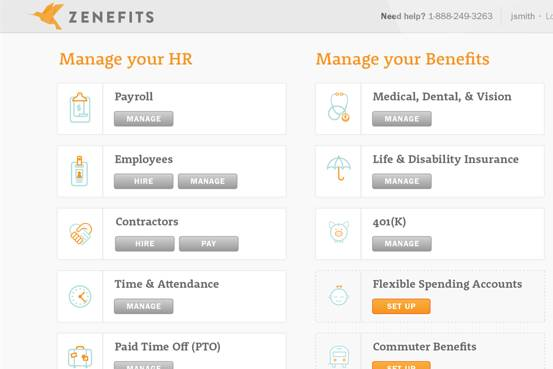 If you’re looking for affordable HR software that can provide you with employee benefits, check out Zenefits. It starts at $40 per month plus $5 per employee per month, and allows you to add on services like benefits and payroll for an additional fee. Read our Zenefits Review for pricing information. Online payroll software is evolving. At its core, it runs payroll and ensures compliance with federal, state, and local taxes, and employment laws. Most payroll software options also provide workers’ compensation insurance. Using payroll software is recommended for businesses that have one or more employees in order to keep payroll compliant and reliable. Similar to HR software, some payroll software companies give you the option to obtain all kinds of insurance plus financial and retirement benefits as well as alternative health benefits. Some integrate directly with benefits providers like Aetna and Blue Cross. 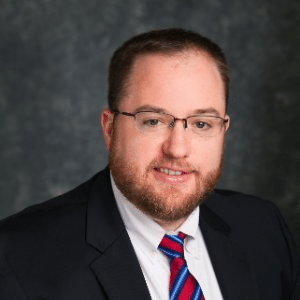 Others, like Gusto, serve as an insurance broker, offering multiple plans. They also track PTO and holidays for you, and process deductions for benefits like a company car or a uniform laundering program. We recommend working with Gusto as a payroll provider. Gusto is continually evolving in the benefits space, and starts at just $45 per month for one employee; additional employees cost $6 per month. We find Gusto incredibly easy to use, reasonably priced, and they have excellent customer service. You can read our full Gusto Review for more information. 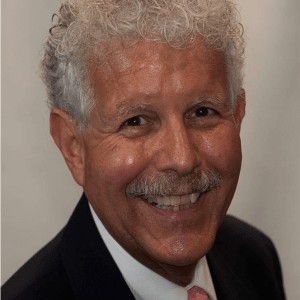 The SHOP Exchange was created by the Affordable Care Act (ACA) as a way for small business owners to provide their employees with medical and dental insurance. Some states run their own SHOPs and others use the federal government website. The SHOP Exchange is ideal for businesses from one to 50 employees that want to provide health insurance for themselves and/or their team. If your business is under 25 employees and you yourself are on the same SHOP health plan as your employees, you can get up to a 50% tax credit. Therefore, it is worth it to get a quote from the SHOP Exchange. Independent insurance brokers and insurance companies can provide all kinds of insurance, such as health insurance, dental, vision, life, and disability insurance. Some also offer small business financial services and can provide a 401(k) and retirement planning. If you go this route, ask about alternative health benefits, cafeteria plans, and commuter benefits as well. However, insurance companies won’t be able to manage your PTO and holidays like HR/payroll software or a PEO can, and you’ll still need to manage the deductions through payroll. That’s why we suggest ADP TotalSource. It saves you the trouble of working with brokers and multiple insurance companies; it manages those relationships for you while providing volume discounts. 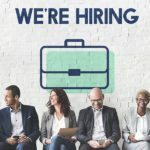 If you feel that your business needs don’t fit into one of the categories above, or if you have a limited budget, it’s best to also look at alternative benefits providers like local credit unions, outsourced HR companies, student loan repayment programs, and local insurance companies. Some alternative health benefits include things like section 125 cafeteria plans, Health Reimbursement Accounts (HRA), Flexible Spending Accounts (FSA), and Health Savings Accounts (HSA). Many of these benefits can be provided to the employee as pre-tax deductions. Employee benefits can range from a free coffee mug to the typical health insurance provision. Each kind of benefit can be provided by a specialty benefits provider. However, some providers can offer multiple kinds of benefits. Be sure to ask questions about the exact benefit offerings available, as well as their costs. Professional Employer Organizations (PEOs) Small businesses with 10-50 employees that want to offer a full range of big-company benefits to their employees—from medical benefits to 401(k). HR Software Small businesses with 10+ employees that want basic HR features, like onboarding or org charts, in addition to benefit offerings like medical and life insurance. Payroll Software Small businesses with 1+ employees that want to track benefit deductions correctly in addition to running payroll. SHOP Exchange Small businesses with 5+ employees that want to provide health or dental benefits through the Affordable Care Act (ACA). Insurance Companies or Brokers Small businesses with 50+ employees that want to try to negotiate good insurance premiums on their own. Alternative Benefits Providers Small businesses with 1+ employees that only want to offer out of the ordinary benefits such as flex spending accounts or commuter benefits. If you’re looking for an affordable HR/payroll software, consider Gusto, as it offers a full employee benefits package. Gusto is best for those who don’t mind tracking time worked and running payroll themselves. It gives you self-service options so employees can sign up for and get their benefits through the same system you use for payroll processing. Most cloud-based HR and payroll services allow you to sign up for a free trial. That’s the best way to determine whether the interface is easy for your management team as well as if the self-service options will work for your employees. Some, like Gusto and Zenefits, offer mobile options that let employees check their balances or search for a provider using a smartphone. 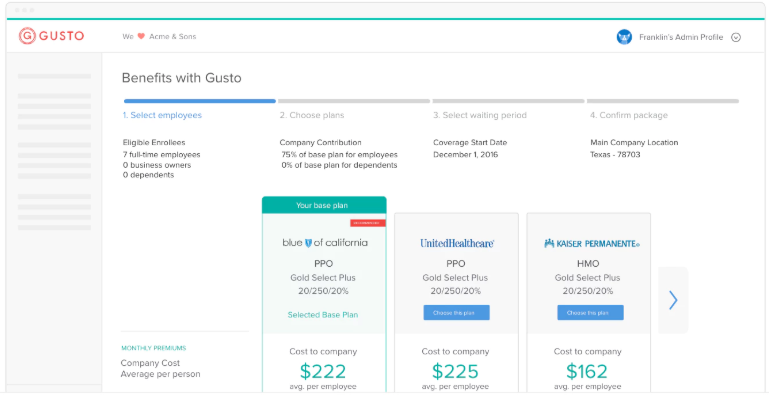 If you’re looking for an all-in-one HR and payroll software that also provides benefits offerings like healthcare and 401(k) in most U.S. states, consider Gusto. They provide a mobile-optimized website for employees to manage their HR changes, view pay stubs, and access benefits from their mobile device. Try Gusto free for 30-days. There are other types of benefits that can be provided within your employee benefits package. We place them into the “alternative benefits” category because they don’t cost much, but nonetheless provide value to your employees. Basically, you’re giving every employee one week’s pay for not working. However, remember how much you might save in employee turnover if they choose to stay with your company rather than move to another job that does have paid time off. In that sense, paid holidays and vacation time are more of an investment in keeping your employees happy. Some fringe benefits are provided to the employee pre-tax, such as tuition assistance. Others, like snacks in the lobby, can be written off as a business expense. Costs vary. But if you pay off a student loan, give an employee a laptop (or other item) that they can use at home for personal use, or hand them a holiday bonus, that income needs to be reported as income on the employee’s paycheck. IRS rules are provided for reference, and we recommend getting guidance from your tax professional. Fringe benefits may be more valuable to your employees than you think, particularly if you employ millennials. A 2017 survey by Millennial Personal Finance found that 46% of recent college grads would give up paid time off for student loan repayment assistance from their employer. Why is it a good “investment” for employers to pay for their employees’ continuing education or college courses, or to pay off their student loan? Employee retention! How do great employers keep their star employees? They invest in them. Tune your super employees via radio station WIIFM: What’s In It for Me. Compare a raise of “x” dollars with paying for a continuing education or college course that helps your employee and business to grow and learn new skills. A business needs to analyze the metrics of how long its employees stay. If you are seeing a trend of high turnover, then change something. Work-life benefits may cost nothing, for example, if you let employees work a flex schedule and they’re able to get their work done. Others vary based on whether you’re purchasing something to improve work life balance (healthy snacks or gym equipment) or giving them time off. Let workers manage their own flex-schedule as long as they get the job done. Allow new parents to bring quiet babies to work or let well-behaved children study in the back room after school so they’re not home alone. Provide a nap or quiet space for employees to use during their break or lunch. Provide exercise equipment or a massage chair for employees to use on the job. Give each employee one day off per year to do volunteer work in your community. Allow computer workers, such as designers and professionals, to work from home. Consider letting well-behaved pets come to the office one day a week. Allow sales and service workers to use the company vehicle for personal errands. Offer a short-term loan to an employee moving into a new apartment. Employee benefits for small businesses that would add value are work-life balance benefits, providing opportunities for employees to have a flexible schedule or work a day from home. Other benefits include gym membership, discount programs, and training reimbursements. Employees place different values on perks, so know your employees and structure your program accordingly. Below are questions small business owners may have when setting up employee benefits. If the question you need answered isn’t shown below, you can post it on our forum and typically get a reply from one of our experts within a day or so. Are paid holidays or paid time off a required employee benefit? No. But in states like California and Oregon, paid sick leave is required. For a list of all states that require paid or unpaid sick leave to be provided, read our state sick leave laws article. In addition, if you do offer holiday or vacation time, be aware of your state’s laws for payout of accrued balances when an employee leaves the company. When is a small business required to offer employee health insurance? The Affordable Care Act (ACA) mandates that healthcare benefits be offered to employees once an employer has 50 or more full-time employees (FTE) on staff. How can I find out what benefits my employee want most? The best way to find out what your employees will value most is to conduct a survey. Survey tools like Zoho Survey let you write questions and send employees a link they can use to fill out the survey anonymously. Of course, if you have an open culture, you may simply want to share what you can afford, and see what your employees prefer that money be spent on. What if I have zero budget for an employee benefits package? Contrary to popular belief, more money does not correlate with greater job satisfaction. This is good news for small business owners: They can provide benefits such as more interesting work (try job rotation) or better alignment between employee values and the work environment (arrange a volunteer effort to build Habitat for Humanity, for example). Owners can also provide greater autonomy, if only on a limited basis, or ask employees for their opinion (individually or in staff meetings) to improve both morale and motivation. What should I know before purchasing health insurance for my employees? Health insurance, being the most sought-after employee benefit, isn’t required to be provided by employers until they reach a threshold of at least 50 employees. To help you as you consider offering employee health insurance in particular, we’ve compiled answers to the 15 most common questions you should ask before you buy employee health insurance. Where should employee benefits information be stored? An employee handbook can be a good place to store your employee benefits policies and open enrollment process. It’s not a bad idea to list the benefits you provide in your employment ads and job offers as well. If you’re using a PEO like ADP TotalSource, or HR/payroll software like Gusto, they can provide an employee handbook you can store online. 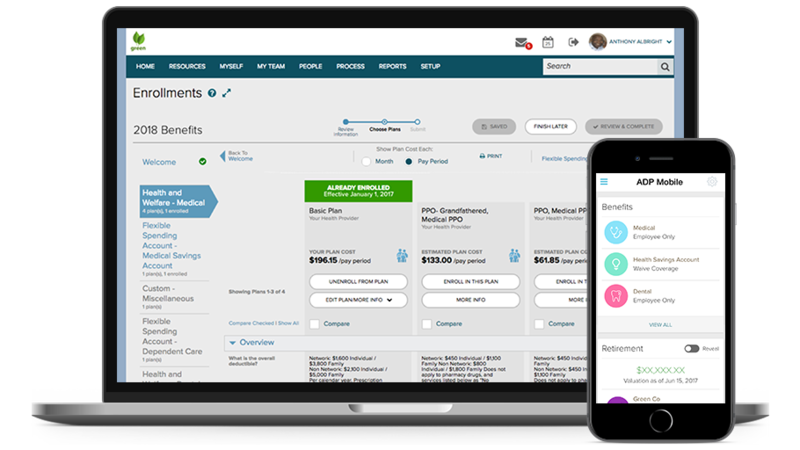 In addition, employees will have an HR portal dashboard with mobile access to be able to view and manage their employee benefit plan. According to a survey by Aflac, 72% of small business employees say an improvement in their benefits offerings would make them happier. Setting up employee benefits doesn’t have to be complicated or even expensive, and will improve your ability to hire and retain employees. Offering benefits is one of the small business problems that, once you get it right, can actually improve your bottom line by reducing employee turnover. We recommend ADP TotalSource as a PEO that can provide your small business employees with an entire benefits package, including PTO, 401(k), health insurance, and more. Get a free quote. Hello I do not know who to speak with but I have a small business and I do wish to put my employees on a plan . Can you direct me in the right direction. I employee aprox, 40 employees at my peak season 20- 25 on slower time. Kudos to you for wanting to provide benefits to your employees. 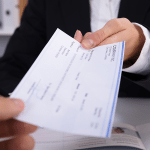 Here is an article on best payroll services — what makes many of these so good is they let you offer benefits to your employees as well. 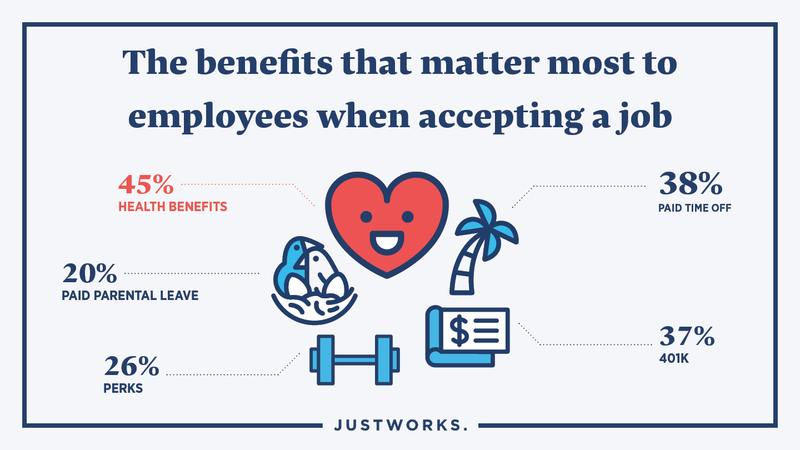 In the US, Justworks is a great option (it’s a professional employer organization). Gusto is also a great option for its benefits buying power — but it’s not yet in all US states. Zenefits is another. Here are some articles to help you choose. Thanks Ronald. We couldn’t agree more! This was very informative. Thank you for your level of effort in creating this. Thanks for stopping by Keane. 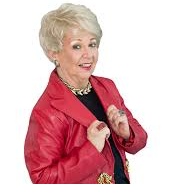 I’m looking into starting my business next year in life coaching. I want to make sure even starting out with just myself that my place of business offers full coverage benefits from health insurance to 401k. I want to know what would be the best option for me??? Happy to answer your question on behalf of Christy. The good news is the options have really increased lately for a solo or small business. You can typically find payroll software that will also supply benefits, like health insurance and 401k. Gusto and Zenefits (which just recently rolled-out payroll) are two of the biggest options.